We’d been planning a trip down to the Western Treatment Plant for about two weeks. And to get a break in our schedule was going to be a bit of a challenge. We’d planned for today, 11th of April, as it fitted in and the weather man had been a bit hopeful of a good day. Wednesday really was a gorgeous Melbourne day and we sort of hoped against hope that it would follow through for today. No such luck. Even as we hit the Ring Road, it was apparent that the sky was, well, grey. And hidden in all that greyness, rain. Which soon made itself apparent as we got near to the Point Wilson Road turnoff. By the time we’d made it up to Lake Borrie, the weather was, well, raining! Not to be disheartened we realised that any great photographic endeavours would be far from us this day. Then to compound the battery on the FZ200 died, and the replacement soon followed. Hmmm. Some Whistling Kites entertained us several times with their aerial antics as they chased one-another and played a game of ‘catch if you can’ with some long water weed heads. One would take it up quite high, and then let it go, the others would then catch, and then drop it as another followed the same process. Lots of claws and much whistling from the others on the tree line. We found another one on a branch in the rain. At first is seemed just to be getting wet. But in reality it was letting the rain run through its feathers for a bathe. I’ve another image over on Flickr that shows it with the wings spread out. Seemed to enjoy the water trickling over the feathers. We were, by late midmorning, contemplating a hot coffee at the Highway Lounge and the weather wasn’t making any likely promises of a change any time soon. 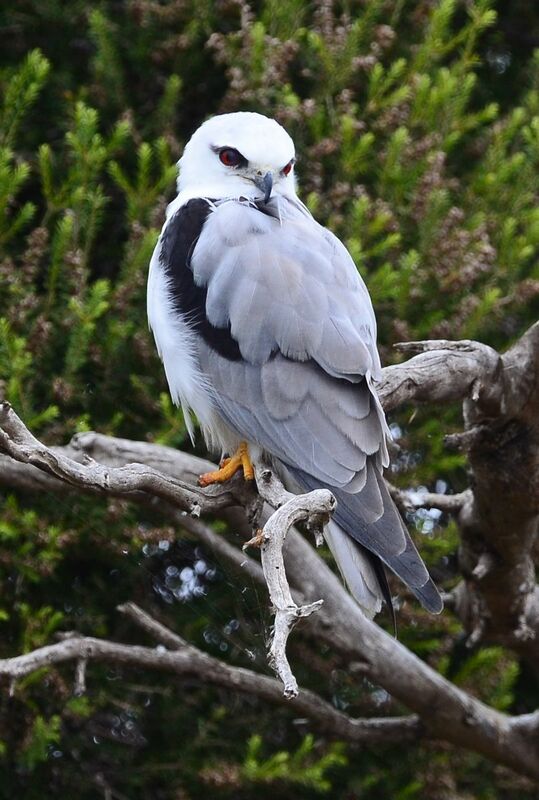 The swans were sitting in the rain preening and then we discovered two Black-shouldederd Kites sheltering in the lee of a tree, and I think that just about confirmed our next move. We drove back along the road that runs by the beach, and first one, and then another landcruiser came past, but it was too wet to stop and chat. I pulled over to let them past. 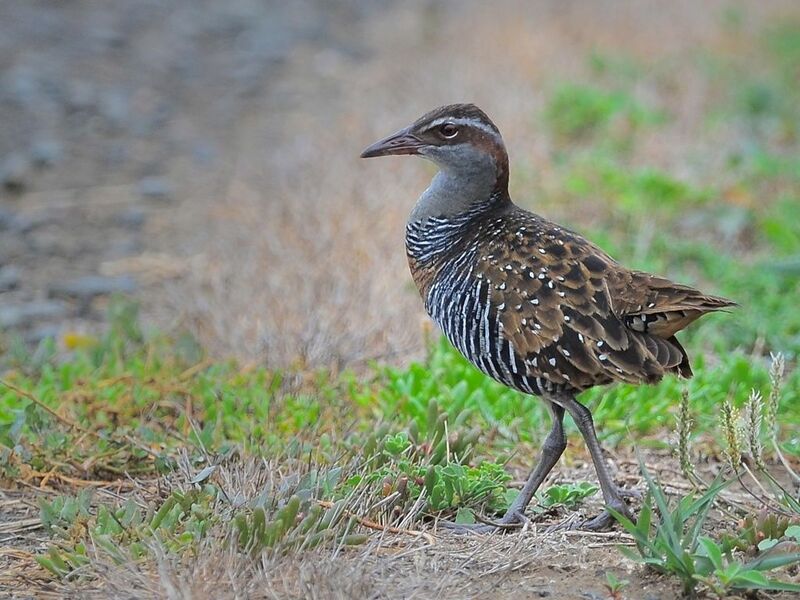 Within about 30 seconds of the second vehicle passing us, just down the road I saw a movement and then Dorothy exclaimed, “Buff-banded Rail” and sure enough bold as Ned Kelly it pops out on the roadway and starts to feed. It must have waited for the other two 4bees to go by. Now its hard not to breath and set up a camera inside the car at the same time, but somehow I managed it, and the rain stopped, and Ned Kelly marched along the road, feeding happily, then sprinted away. Only to turn and come back. Worth going out in the rain just for that. 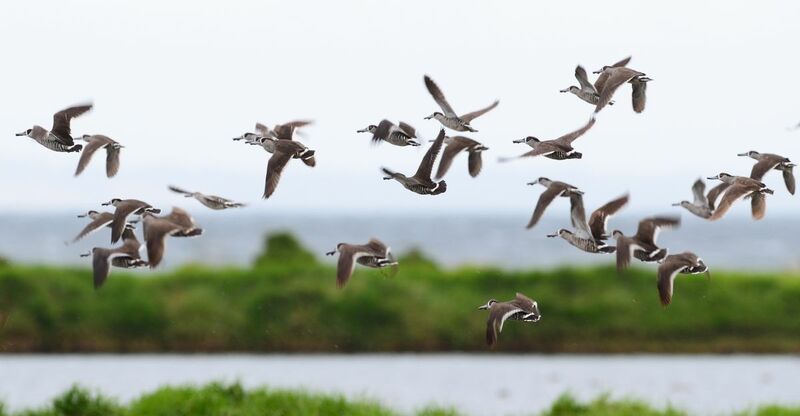 Pink-eared Ducks take to the air at the approach of a Swamp Harrier. 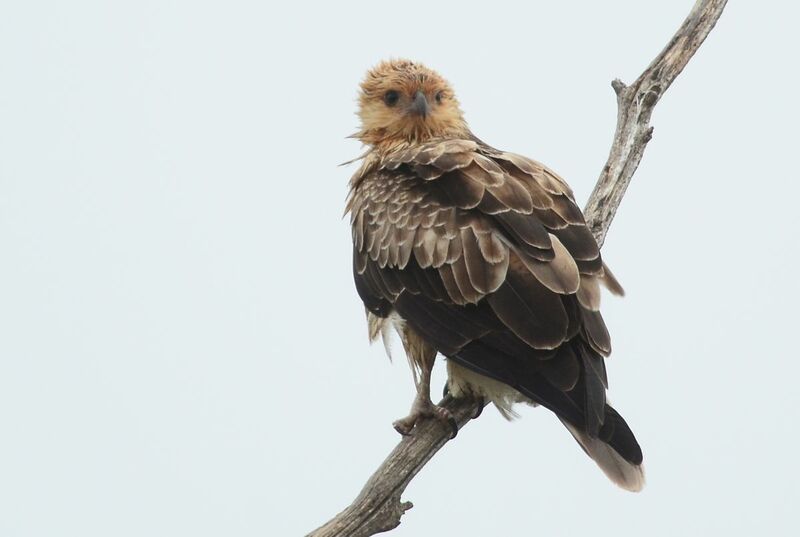 Whistling Kite enjoying a bathe in the rain. It has just fluffed out its mantle and back feathers to get damp. Mr An Onymous often says its worthwhile just being out there, and if you get a decent bird shot that’s an added bonus. This is the bonus for us for the day. Beautiful pics..I was playing across the freeway in Serendip Sanctuary in the rain today. G,day, Thanks for the comments. I like Serendip, just don’t get much time to go down there, always something else to do. Hope the day wasn’t too wet for you.